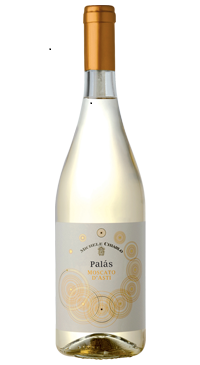 The Moscato grapes come from the vineyards in the heart of Asti and grow on soil that is sandy sedimentary marine origin with an south east exposure. The grapes are hand harvested, and soft whole cluster pressing. The must is stored in a tank at -2°C to maintain the integrity of the aromas, followed by slow fermentation in an autoclave at a a controlled temperature until reaching an alcohol content of 5%. During this process, a part of the carbon dioxide developed during fermentation remains “entrapped”, giving the wine its mild, natural effervescence. Before bottling, the wine undergoes a process of micro-filtration to give the wine its clarity, purity and prevents any further fermentation of the yeasts. The result is a brilliant straw yellow colour with pronounced aromatics of white flowers and tropical fruits. The palate is balanced with a persistent fragrance and fine bubbles and a fresh sweet and savoury finish. Serve chilled with fresh fruit, fruit based desserts and sorbets.